Mary ‘Teddy’ Virginia Brown, 84, of Owensboro formerly of Cloverport passed away Friday, October 19, 2018 at Owensboro Health Regional Hospital. Teddy was born October 5, 1934 to the late James Monroe and Elizabeth Alice Horsley McCoy in Stephensport, KY. Besides her parents, Teddy was preceded in death by her husband, James “Jim” Harold Brown; brothers, Bradley, Marion, Bernard, Elvis ‘Ebby’, Jimmy McCoy, Tom and Bill Sago; sisters, Beulah Jarvis, Mernie McCoy, Velma Noble and Lucille Stiff. 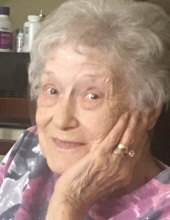 She was a local hairdresser for 17 years, a founding member of the Revitalization Board for the city of Cloverport, a very good cook, a faithful member of the Cloverport Baptist Church and a member of the WMU. Along with these activities involving her faith with the church, she was a Sunday School teacher who is remembered by many of her ‘children’. One great love she had was basket weaving, which she thoroughly enjoyed. Leaving behind to mourn her passing, but celebrating the life that she lived, loved and shared with her family and her other families is her son, Harold Brian (Claudia) Brown, Cheraw, SC; daughters, Marshelle ‘Mitzi’(David) Buchele, Cloverport, Gina (Kelly) Nichols, Irvington; brothers, Orville (Dorothy) McCoy, Owensboro, Bernard ‘Jiggs’ (Clara) McCoy, Cloverport; grandchildren, Shana, Tara, Rachel, Hannah, Zoe and great grandchildren, Dylan, McKenna, Ty, Bella, Levi and Jace. A celebration of Teddy’s life will be held 11:00 am, Monday, October 22, at Cloverport Baptist Church with Bros. Mark Ayers and Wallace Gooch officiating. Burial will follow at Cloverport Cemetery. The family will receive friends and family Sunday, from 1:00 – 4:00 pm at Cloverport Funeral Chapel and Monday, from 8:00 – 10:30 am at the funeral home. In lieu of flowers, donations may be made to the Alzheimer Association. You may share your thoughts and memories of Teddy with the family on our website; www.cloverportfh.com. To plant a tree in memory of Mary "Teddy" Brown, please visit our Tribute Store. "Email Address" would like to share the life celebration of Mary "Teddy" Brown. Click on the "link" to go to share a favorite memory or leave a condolence message for the family.